Seattle journalist and author Blaine Harden spent time in Eastern Washington researching book the he wrote about the great river of the West: The Columbia. His resulting work, A River Lost, was published in 1996. Harden returned recently and updated his book. It was rereleased in April, 2012. EarthFix: Thanks for joining us, Blaine. You grew up in the Columbia Basin with a father who worked on the Grand Coulee Dam in the 1930s-- in fact, you worked there briefly one summer. Harden: I worked there in the 1970s until I got fired. I grew up, I think, like lots of people who grow up in irrigation country. I grew up in Moses Lake, which is in the middle of the Columbia Basin Project. There's sort of this amnesia about how it's possible to live in a desert. People forget that other people's money, federal money, built the dams. And they conclude based on very little that the reason they're there and the reason there's cheap water and cheap electricity is because of their heroic Western individualism. In fact it's nothing like that at all. It's a great gift from the people of the rest of the United States that invested a huge amount of money to make the water and the electricity available. EarthFix: Let's fast forward a bit. It's the 1990s. You're a Washington Post foreign correspondent -- fresh from covering the conflicts in the former Yugoslavia -- and you return home to Washington state to work on your book, "A River Lost." What made you decide to do that? Harden: Well, my mother was sick and I had been traveling for 20 years and I was looking for a way to come home and be with my mom and be with my family and also to learn a little bit about where I came from. I basically wanted to teach myself how the river system worked and why there was so much controversy about it when I came back. At the time there was tremendous controversy about the salmon being listed as endangered species and there was also a big hoo-haw around Hanford, where people were complaining of having gotten cancer from intentional releases of radiation from the people who ran Hanford in the 1950s. EarthFix: How did researching the Columbia River as a journalist and author change the way you understand the place where you grew up? Harden: It completely changed the way I understood the place I grew up in. I just didn't understand that life there was a policy decision made in Washington out of the Great Depression: the construction of Grand Coulee Dam and then the completion of the Columbia Basin Irrigation Project. And over time as the construction of the dams continued and the river was turned from this amazing salmon highway into world's greatest hydroelectric machine, the research helped me understand why that happened and what the sacrifices were. In my reporting I ended up going around and talking to a lot of Indians whose tribes had been, for thousands of years, dependent on the fish. And their lives had been destroyed. EarthFix: One of the figures you write about has been in the news recently. U.S. District Judge James Redden. He's a Portland judge who presided over the Columbia's salmon and dam issues for more than a decade. Redden stirred the pot recently with an interview he gave to a couple of our journalists. Redden said he's convinced the four dams on the lower Snake River should be removed. When it comes to dam removal or breaching, why are those four dams the ones that come up? Harden: Well, those dams come up for discussion and debate because removing them would not be a crushing economic blow to the region. They do not produce the quantities of electricity -- they are not absolutely essential to the grid like Grand Coulee and some of the other dams are. That's one reason. 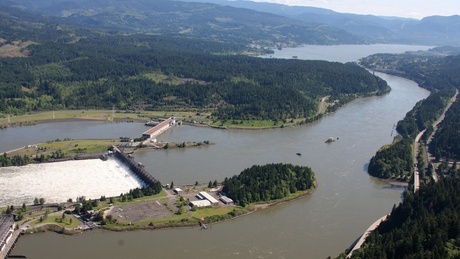 And the navigation piece of those dams that helped Lewiston Idaho become a port. Lewsiton, Idaho, could be a rail port for slightly more money if those dams were removed. And the consequences for keeping salmon from going extinct that move on up the Snake, it just improves so dramatically at a cost that is not that high, given the possible benefits. So that is why they always come up as a possibility. EarthFix: Redden also said his orders to spill more water over the dams to help juvenile salmon migrate out to the ocean has been proven the right answer. Harden: One of the things about Judge Redden that is so interesting is that his willingness to listen to the fish scientists and to implement some of their theories about how to run the river, it has paid off in real dividends. When I finished the first round of reporting on this book in the early 1990s, there was a consideration, there was a thought among the fish scientist, that if we just spilled more water over dams, we might be able to get small salmon down the river and increase the returns. They didn't know if it would work but they thought that this was a pretty simple solution that could pay off real biological dividends. The truth is that because Judge Redden allowed the spill over the dams -- forced the Bonneville Power Administration, the of (Army) Corps of Engineers and the other people that run the river -- forced them to spill more water over the dams, in fact it does turn out that you get significantly greater returns of salmon. EarthFix: A River Lost was published in 1996. What made you decide to update it for its reissue, which came out last month? And talk about what you found had really changed. Harden: In some very essential ways, nothing had changed. The dams aren't going anywhere, except possibly those lower Snake dams, which could come out but that doesn't seem very likely. However, a couple of things have happened that are new twists on that. One is that the high-tech industries, they have plugged in, quite literally, to the hydro grid to take advantage of cheap power and they've built these server farms, which are big warehouses full of servers, along the Columbia in places where the power is cheap. So they have, in effect, given themselves and everybody who uses Google search or Microsoft search, or anything, they've given them a stake, a real-time stake, in the damming and the perpetuation of the river system. So that's new and I think it helps support the status quo. But the other thing that happened is what I was just talking about before: that scientists have come up with a way to manipulate the river that improves the return of adult salmon in a way that could keep the Columbia and the Snake system relatively robust for salmon going forward. And that's an immensely hopeful development that I didn't see when I finished the book.